Husbands have received God’s call to love their wives in the same way Christ loves His Bride, the Church. When a husband displays this kind of love in his marriage, he goes against the grain of our humanity. He engages in behavior many would consider revolutionary in today’s society. More significantly, when a husband loves his wife as Christ loves the Church, he brings great joy and sweet peace to his home and marriage. 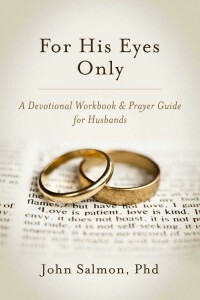 For His Eyes Only is a devotional workbook and prayer guide to help husbands live out the Christ-like, revolutionary love God intends for marriage. The short chapters in For His Eyes Only provide husbands straightforward, practical advice to help them become the husbands God has called them to become. Each chapter includes questions and action tips to help husbands put the principles of God’s design into daily practice. The chapters end with a simple prayer asking God to help us love our wives with a Christ-like love. For His Eyes Only may provide just what you are looking for to take your marriage to the next level. Read a sample chapter @ Prayer Changes Things.